A great birthday, with fab weather and some lovely countryside. 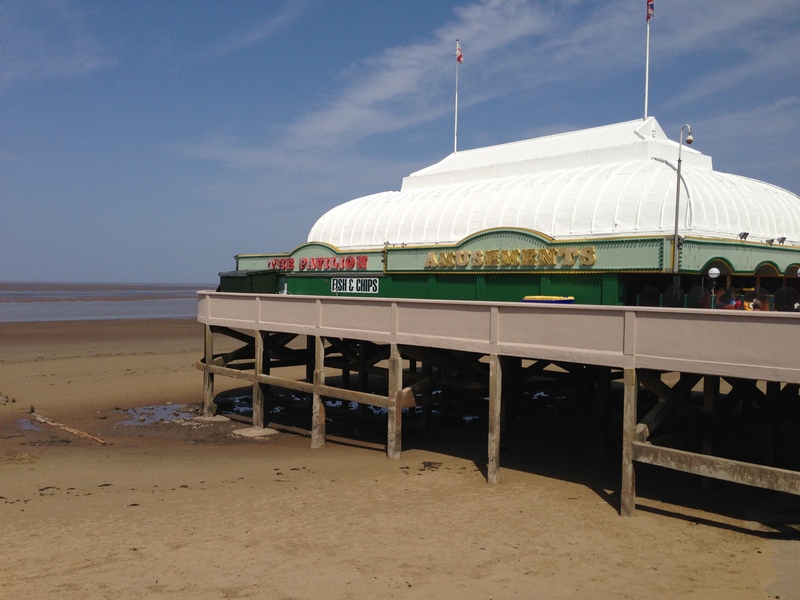 I had a few strange dreams overnight, no doubt due to the cabaret performances I’d born witness to at the Beachcomber Inn. Still, it had been a thoroughly enjoyable evening, if not always for the right reasons, and I’d got a tenner from Pauline for the Big C so all good. I only just remembered it was my birthday, 38 today, so I had a lie in until 08.30 to celebrate. For some reason I’m more of a fan of odd numbers than even numbers, don’t know why, so I wasn’t particularly excited about being 38, I’m pretty much stuck at being 33 anyway. I spent 30 minutes checking my bike over breakfast, then had a shower and packed up. I had to take advantage of that plush toilet block one more time. Somewhere in between finishing my bike checks and getting back from the shower another spoke had managed to go ping. It was the non-drive side again so I thought I had spares, however upon trying to fit a new one I discovered I’d been given the wrong length spokes; maybe that bike shop in Cardiff wasn’t so good after all. This was pretty annoying as the shop had measured them up, but I should have checked myself rather than just trust that they’d got it right. Instead of fitting a replacement spoke I had to tighten those adjacent to the break to get rid of the slight buckle, and hope they held out until I could reach another bike shop. 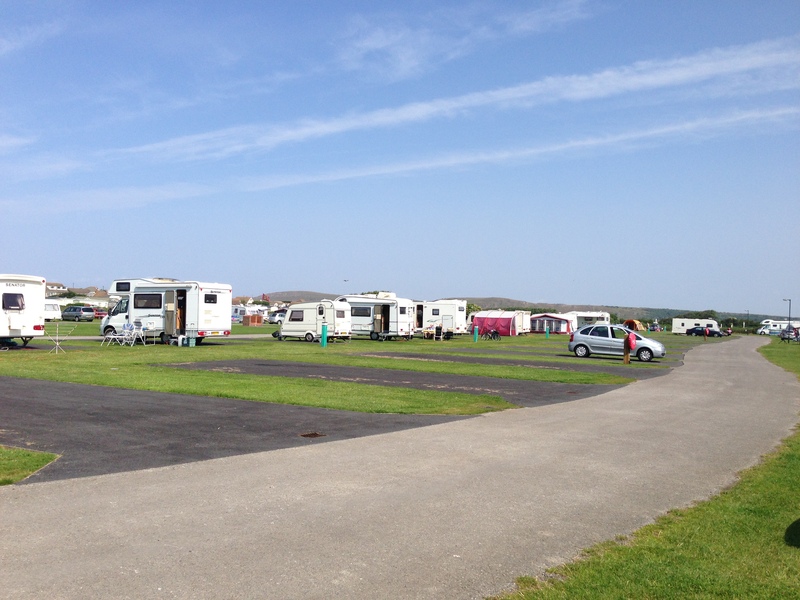 As I loaded up my bike more punters were arriving for the weekend in an almost constant stream of cars, caravans and motor-homes. The good weather must have been encouraging more people to get out in the fresh air. Due to bike fixing I didn’t get away until 11.00, with someone else immediately taking my vacated pitch. It was a bit like a full car park with people driving around waiting for someone to leave, and made me realise I was going to have book sites in advance if I wanted to guarantee a space now. From Brean I rode along to Burnham-on-Sea and stopped at a small bike/car accessories shop, but they didn’t sell spokes and claimed I was unlikely to be able to buy them individually. To be honest I’m not sure he was the world’s foremost expert on bicycles, however he was able to recommend a good shop in Bridgwater where they build their own bikes, so were bound to have spokes for sale. 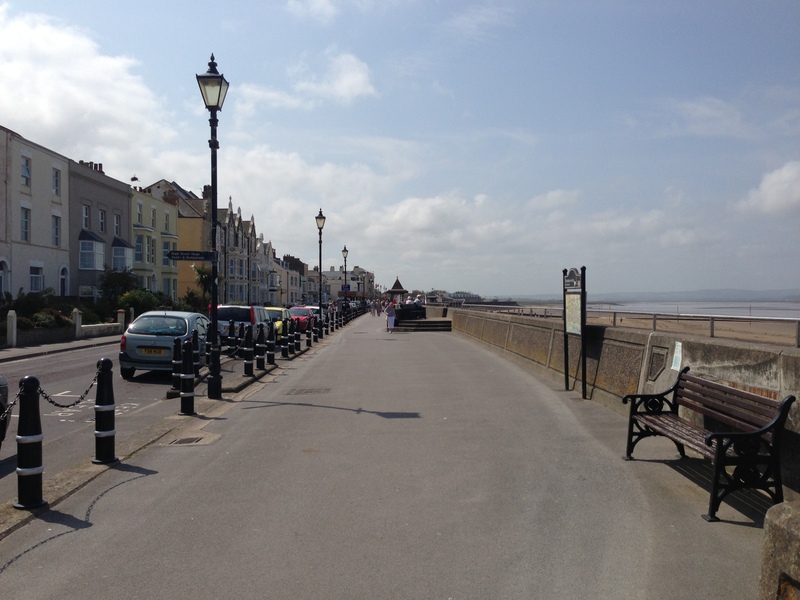 I rode down the seafront in Burnham before heading off towards Bridgwater, which was en-route anyway. I needed to swing inland slightly to find a crossing over the River Parrett. I passed through Highbridge and pedalled on to Bridgwater, which has a slightly confusing one way system. I eventually found the bicycle shop, SJS Cycles, on St. John’s Road. They’re also the home of Thorn Cycles, who manufacture touring and tandem bikes. Each bike is assembled specifically to an individual’s requirements, and they carry a massive stock of frames, brakes, gears etc. and more importantly spare spokes. I had a chat with one of their engineers who noticed the majority of the spokes on my rear wheel, aside from those I’d replaced, were pretty poor quality meaning they’d probably break as well. I need DT spokes apparently, which are much less likely to break down at the elbow as the angle is better, and they’re just stronger. I bought half a dozen new spokes, all of the correct length, for a few quid, and replaced the broken one in the shop. After straightening my wheel I was ready to set off, having learned more about wheel maintenance again. I stopped briefly for a lunchtime snack and then rode west from Bridgwater, fighting through the busy traffic and confusing roads to the A39. 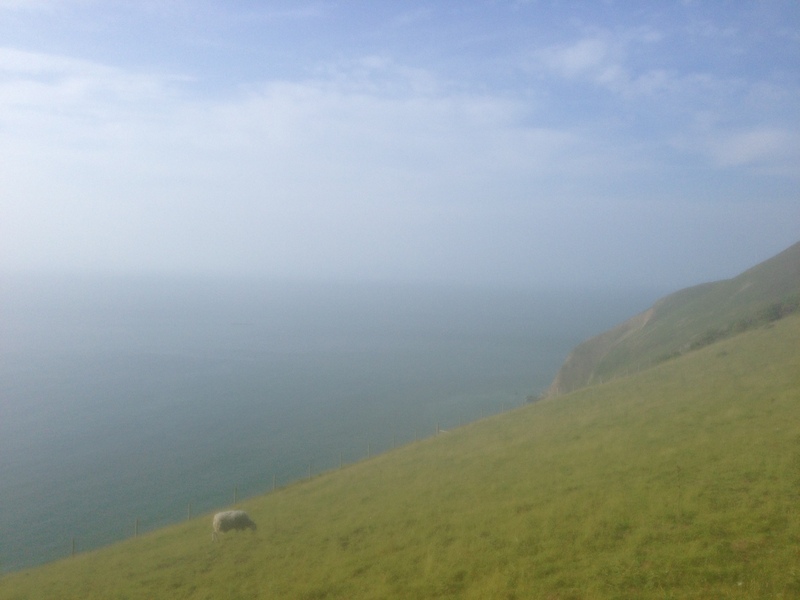 There followed a long stretch back down to the coast and Watchet, through pleasant Somerset countryside, and then along to Blue Anchor, followed by Minehead. I think there’s supposed to be a cycle track from Blue Anchor to Minehead but I couldn’t find it, so had to rejoin the A39. 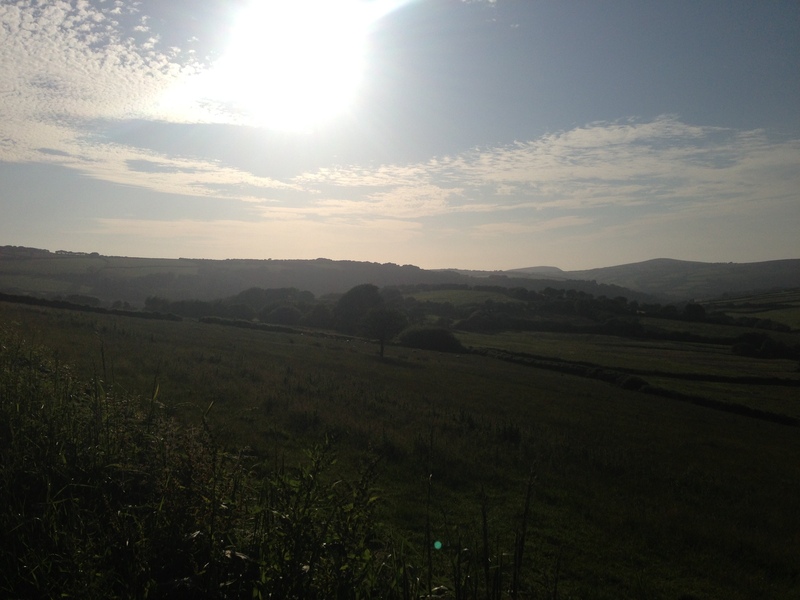 It was great to be cycling in good weather for a change, and I felt my morale rise accordingly after the hard slog through Wales. 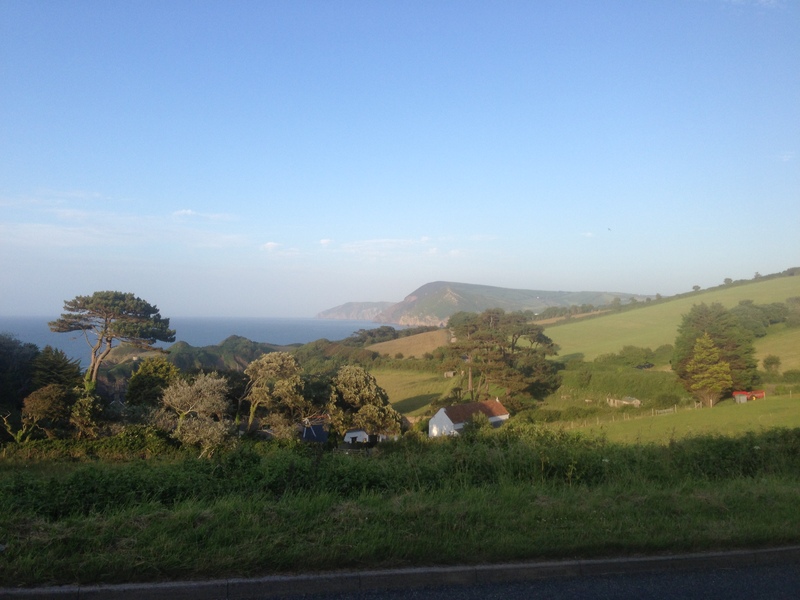 Pausing in Porlock, a picturesque village in the heart of the national park, I refuelled on bananas and crisps in preparation for the Porlock hill climb. 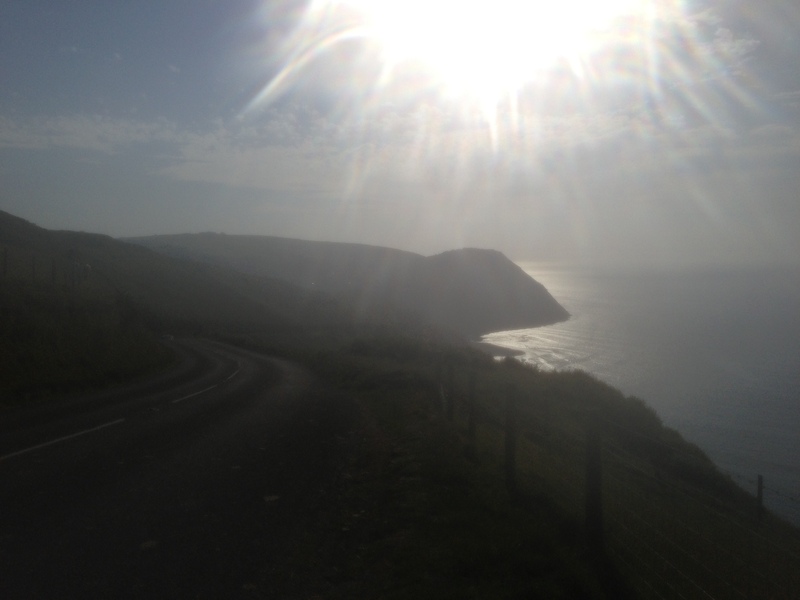 There are two ways you can tackle the hill out of Porlock, which is somewhat renowned amongst cycling circles. You can either take the A39 which has a really steep start to it (25%), followed by a long climb that isn’t for the feint hearted, or you can take the toll road which is longer but less steep. The main road was absolutely jammed with traffic so I opted for the toll road. 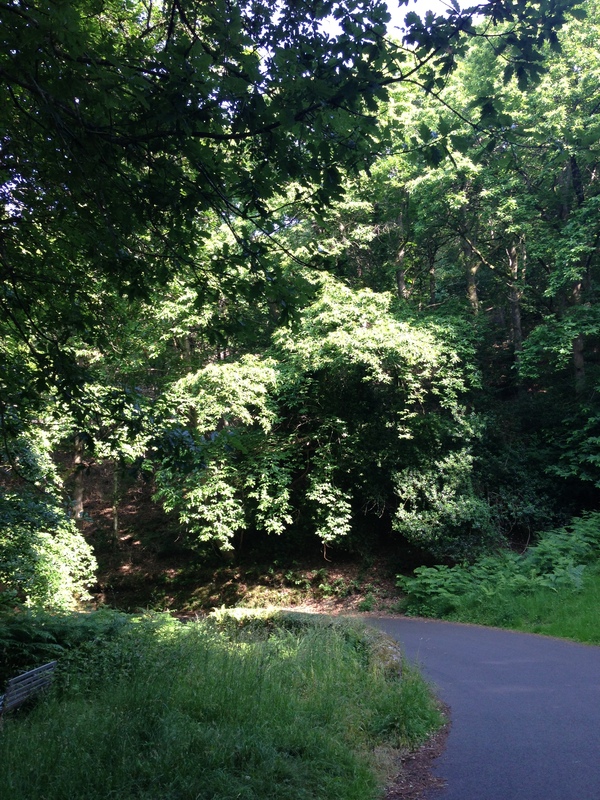 I really enjoyed the toll road, which although a very long hill climb was kind of cuddly, never being too steep, and passing through some gorgeous woodland with great views down to the coast. Consequently I seem to have taken a lot of photos. 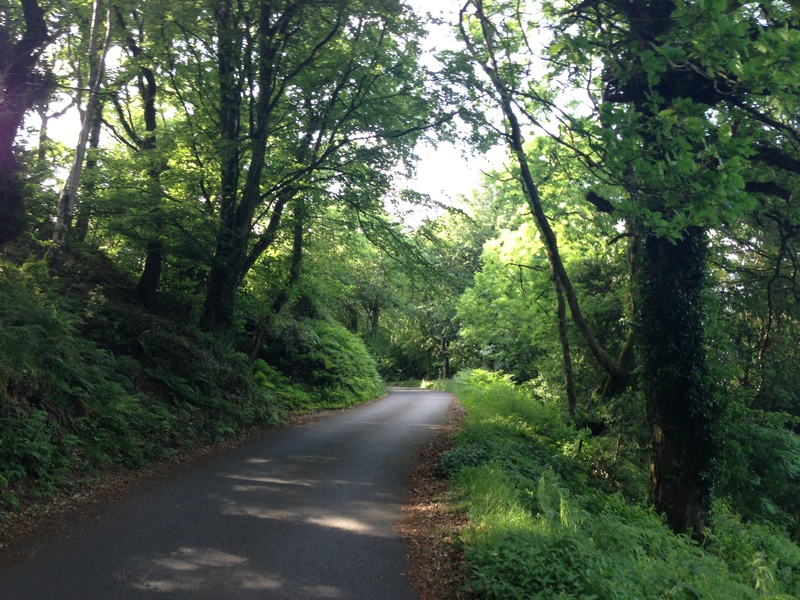 The advantage of this road is the lack of traffic, compared to the A39, and I revelled in the quiet countryside, free of car fumes, and with birds singing all around me. 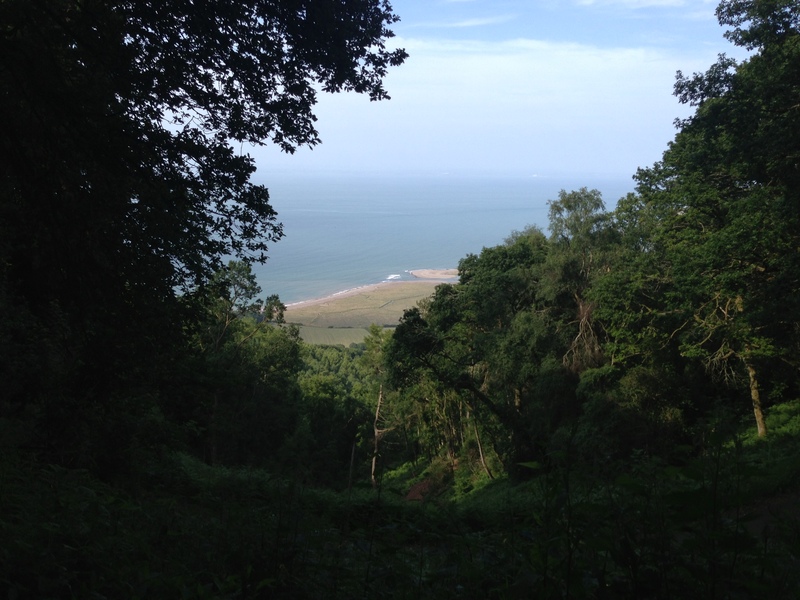 The toll road rises just over 4 miles before rejoining the A39, and overlooks Porlock Bay which you can often glimpse through the trees. 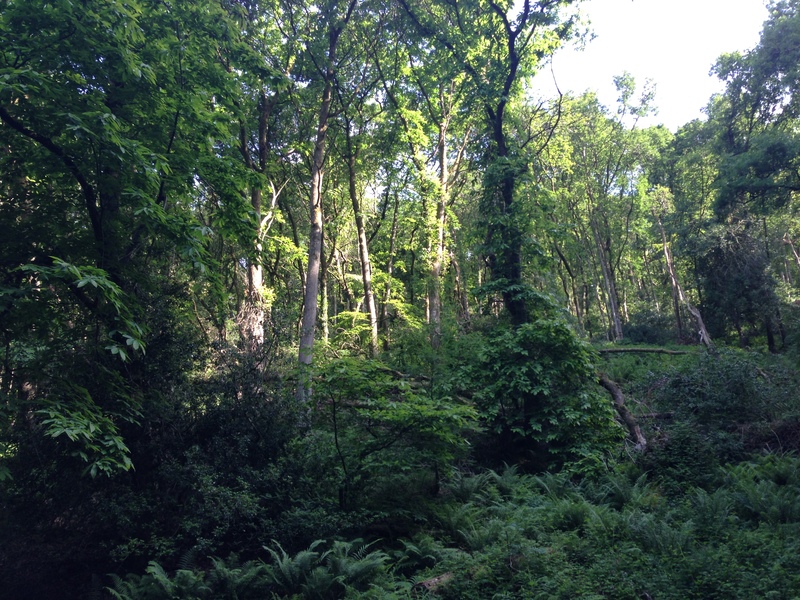 I loved the way the sunshine was coming through the trees, showing off the forest at its best, with lots of different shades of green. The toll house is about half way up, and cost me a quid for my bike – good value. I had a nice chat with the toll collector, feeling very relaxed. Shortly afterwards I passed a cyclist going the other way, travelling downhill at a rapid pace. I hoped his brakes were good as there are a few hairpins you have to contend with. The gradient on the toll road never goes above about 1 in 14, which is mild compared with the main road. 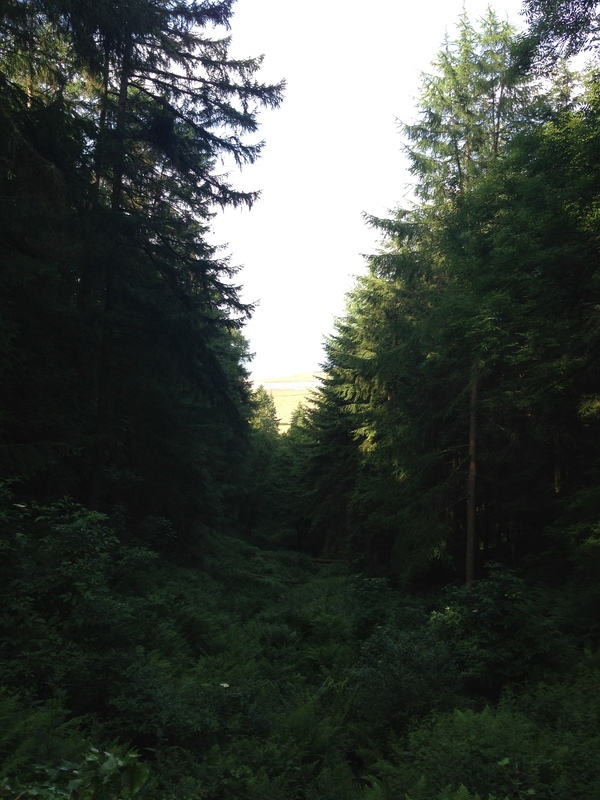 I finally made it out of the trees and was afforded with some fantastic views down to the sea, and across the moor. 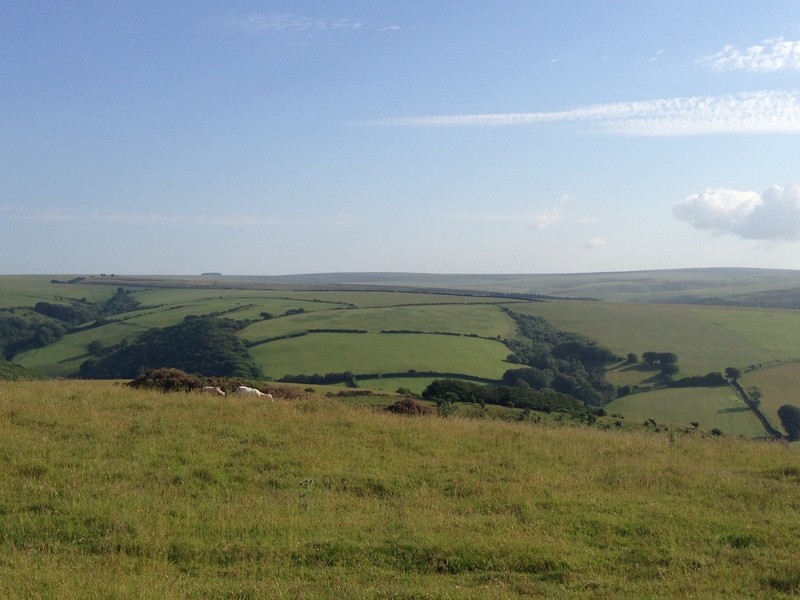 I paused for a few minutes at the top, just to take it all in, before carrying on across Exmoor. I later learnt I’d cycled up the toll road at about the same time my parents had been driving down the main road. They said I’d made the right choice, the main road being very busy. Drivers can be little impatient when they get stuck behind a cyclist on a steep hill for ages. 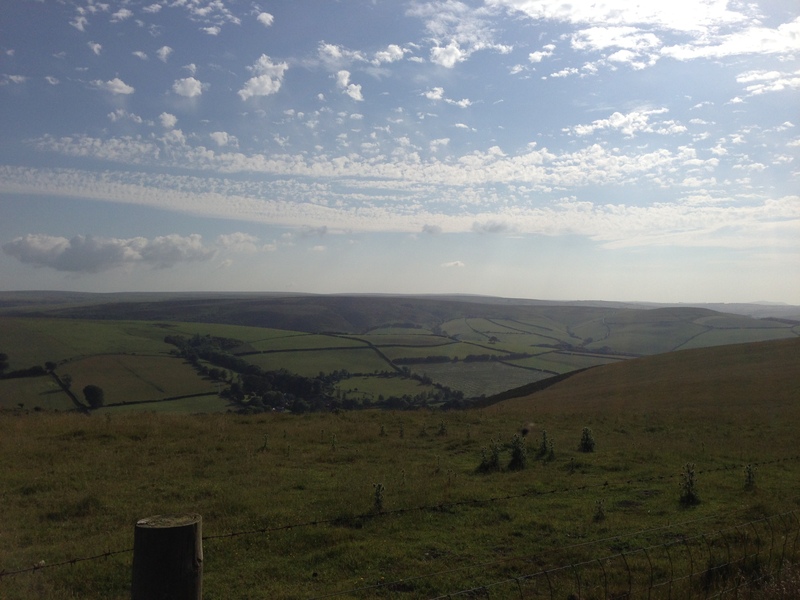 After Porlock I rode across the top of the moor, on a fairly flat section through more great scenery. There were a few sheep hiding on the moor though, so not everything was quite as tranquil as it might appear. They can ambush you at any time so I had to keep on my toes, or on my pedals as it were. 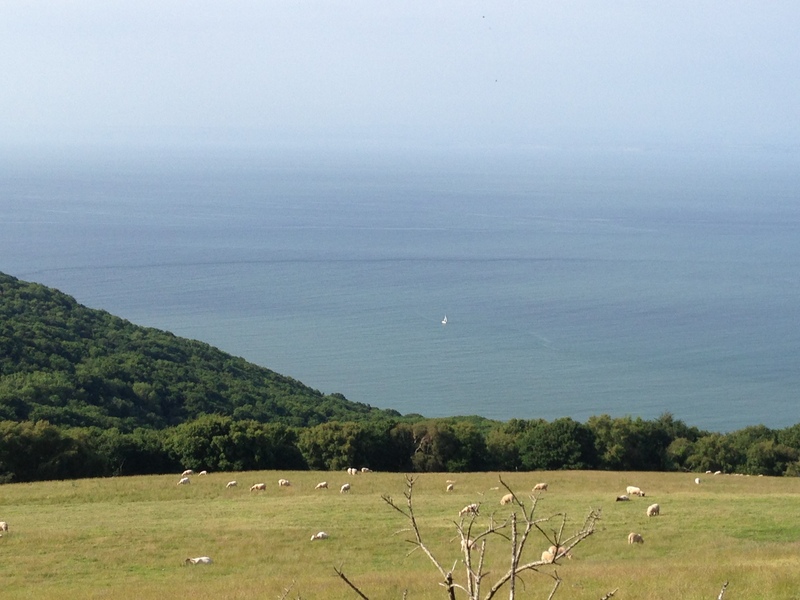 After a few miles I rode down Countisbury Hill into Lynmouth, where the road travels right next to the coastline, affording more lovely views. There was a slight haze in the air, which the sheep were using for cover to hide their movements. 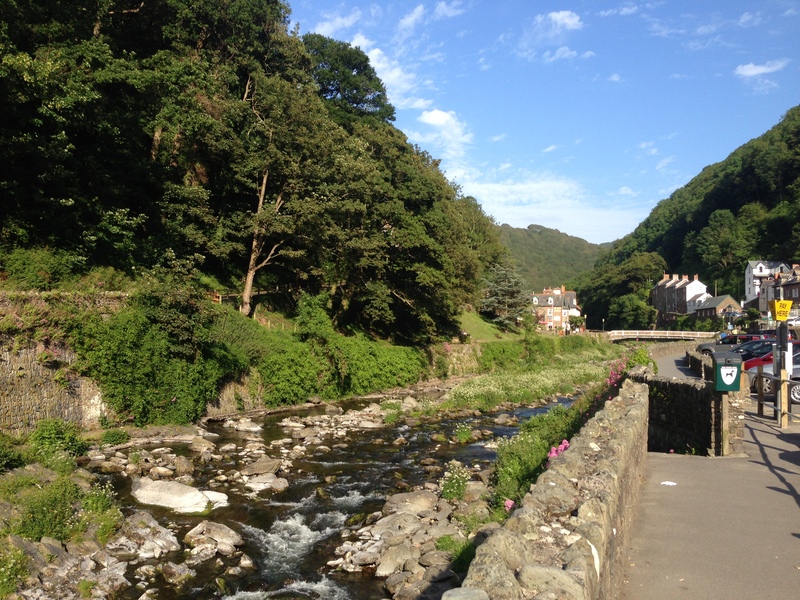 Lynmouth is another pretty village, having had to be rebuilt after the huge flood in 1952 which destroyed over 100 buildings, most of the bridges, washed cars out to sea, and killed 34 people. 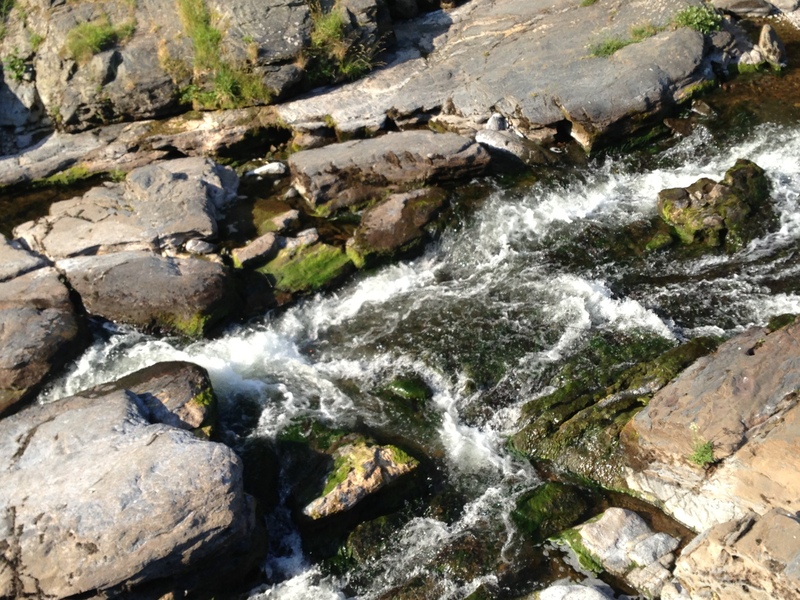 The river has been diverted around the village now to avoid a repetition. The river has a huge catchment area so it’s not surprising there’s a flood risk. In 1952 the flood waters backed up behind a natural damn of river debris, including lots of trees washed into the swelling waters. When this eventually broke it sent a huge wave of water and debris down the valley, straight through the village. 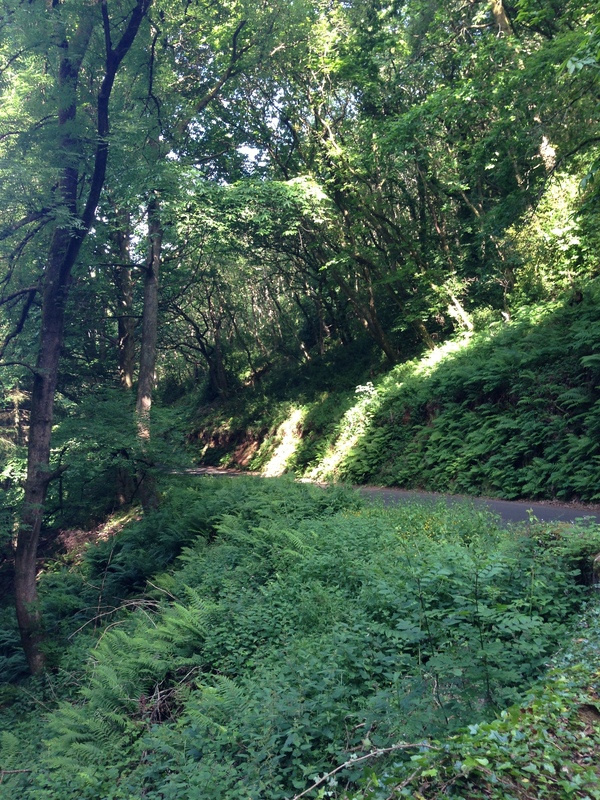 The hill out of Lynmouth was a leg killer, being 25% in several places and going on for at least a couple of miles. 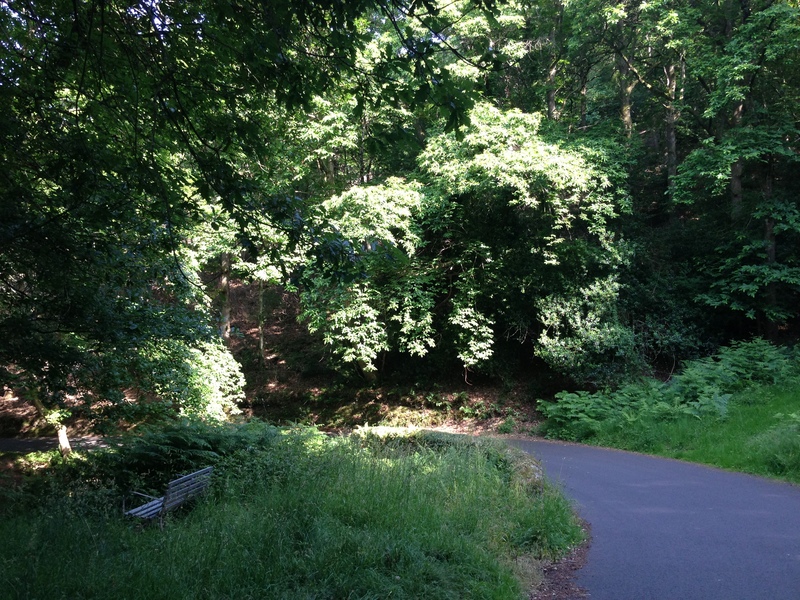 I chose to take Lynbridge Road (B3234), the more direct route alongside West Lyn River, rather than go the long way round on the A39. 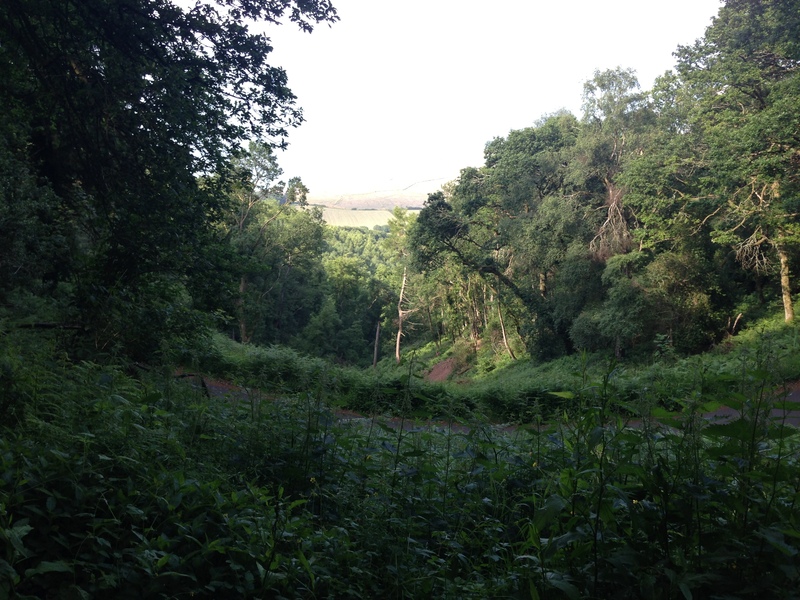 With the benefit of hindsight I should have gone for the longer and less steep route, however I missed the turning. I had to stop and rest 3 times up the climb, which was probably the hardest I’d had to tackle gradient wise to date, and I admit I did have to push for 10 metres or so just because it was so steep I couldn’t get going again without sliding backwards. I needed to get to a flatter bit just to start pedalling again. 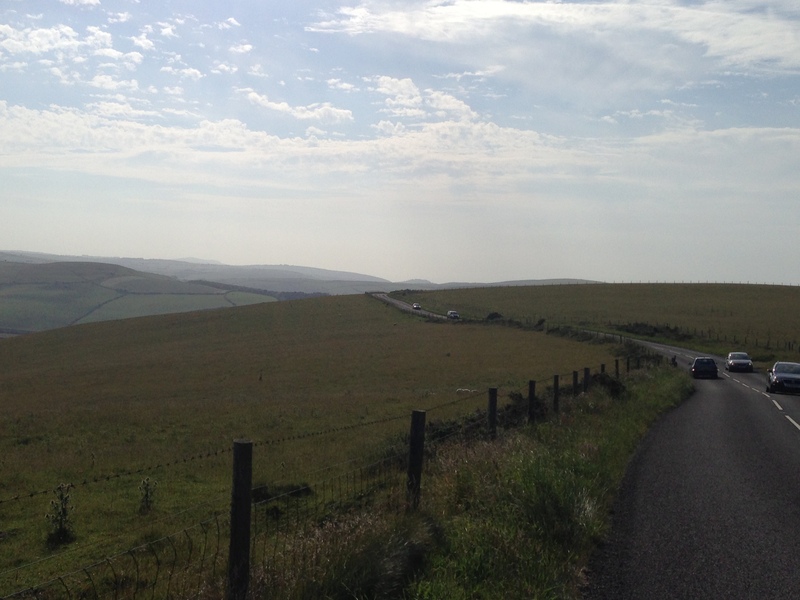 I finally made it to the top and continued on the A39, which I’d rejoined, through more of Exmoor and then down a lovely long descent on the A399 towards Ilfracombe. It was a great ride down to the coast as the light started to fade, past various good looking pubs which I was sorely tempted to stop at, and a nice little harbour at Combe Martin. 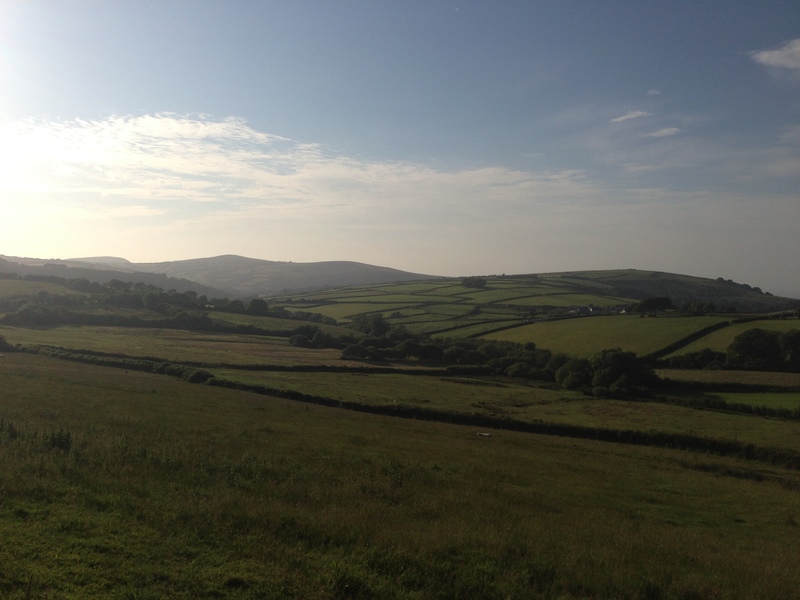 My parents had already arrived at their B&B in Hele, where my campsite for the night was also located, so I needed to get a move on. It had been slow going today with all the hills, and a few stops for bike repairs. 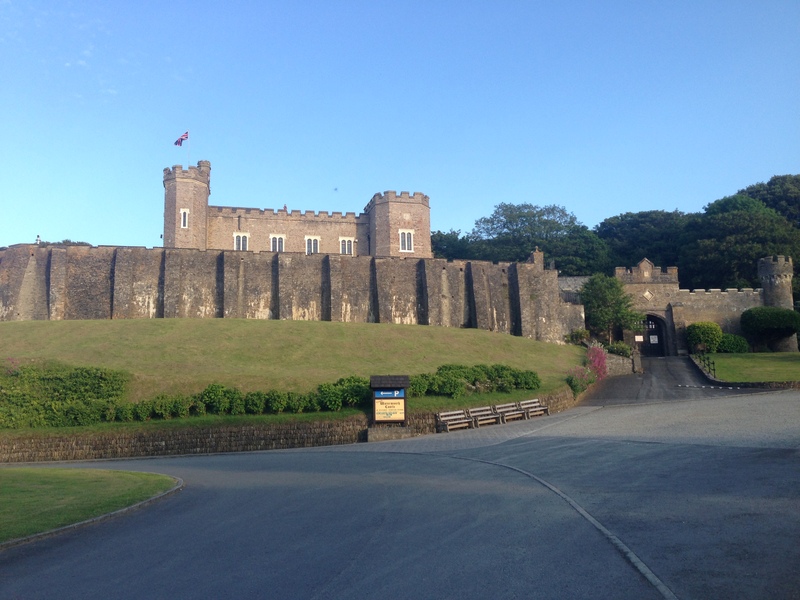 I passed the castle at Watermouth, then pedalled slowly up the last hill before Hele and free-wheeling down to the campsite. After having a nice chat with Sandra who was on warden duty at Hele Valley Holiday Park, I pitched my tent at about 20.30. Sandra and all the staff at the holiday park were really welcoming, and interested in my cycle ride. I’d recommend the campsite for anyone passing through. I called my parents to let them know I’d arrived, and they promptly turned up to collect me so we could go forth and feast; although they did omit to bring me a beer, but I’d forgive them despite it having been a very thirst inducing day. We went for dinner at the Hele Billy Pub/Restuarant, just managing to get in and order before the kitchen closed thanks to an understanding chef. It was great to see my parents and catch up, and even better as they were paying. 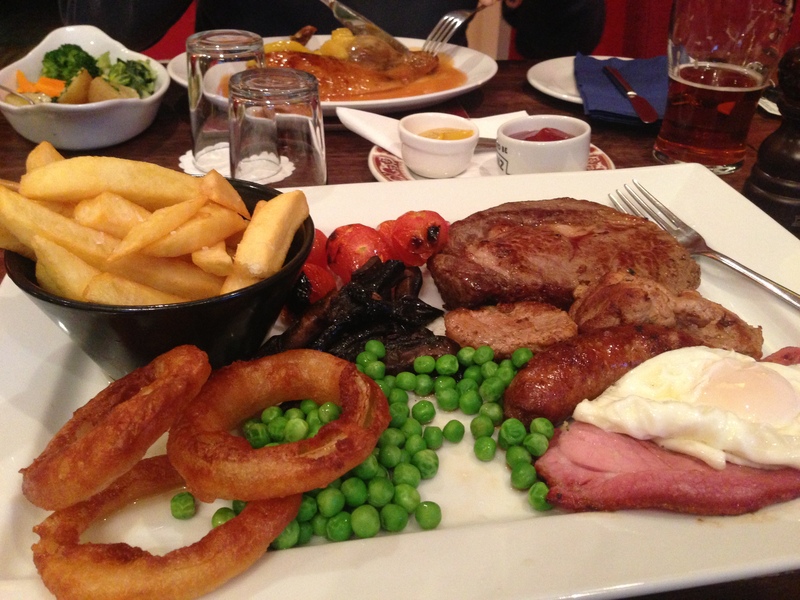 I duly consumed a huge mixed grill, as well as most of my mother’s potatoes, and the cheesecake for dessert before I finally felt full. 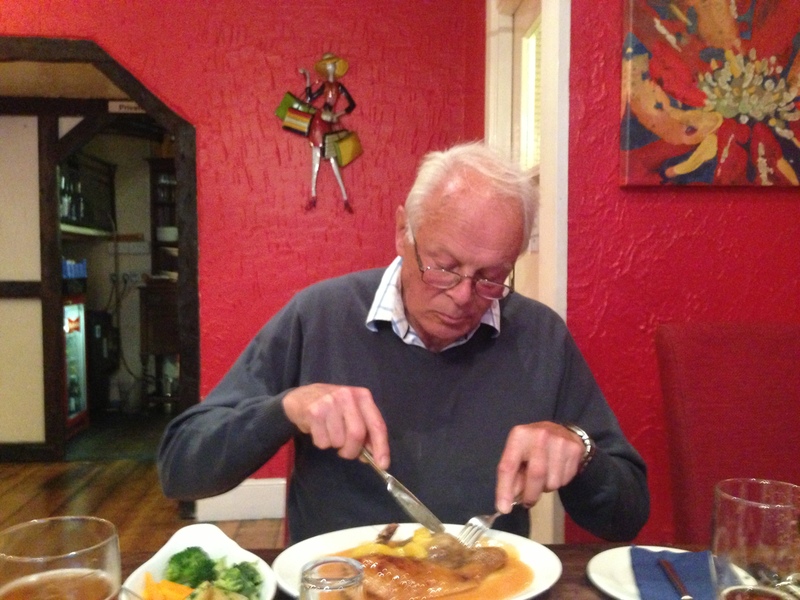 Unfortunately my Dad didn’t leave any morsel unfinished on his plate, but I probably couldn’t have eaten anything else after all that, as well as a few pints of very welcome Devonshire cider. 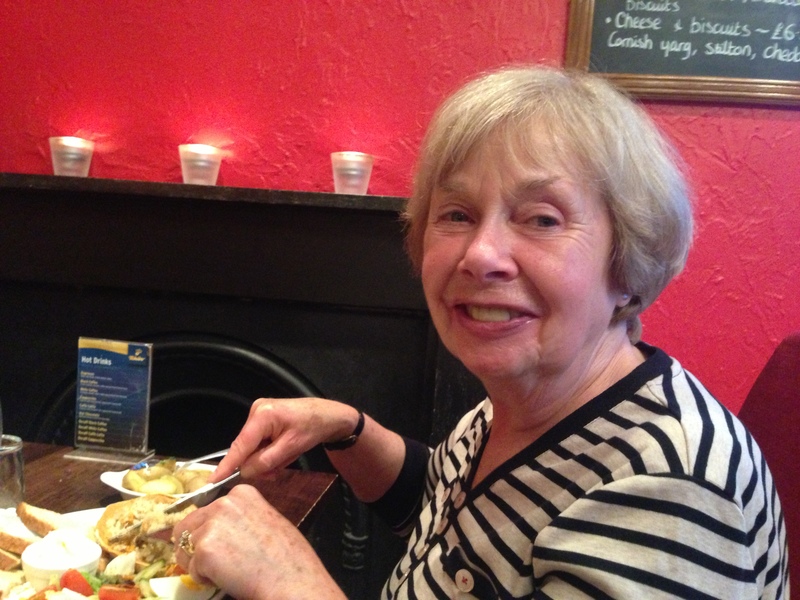 All in all it was a great birthday celebration, in a cool pub, and lovely to spend it with my parents. Thinking about it I probably hadn’t spent my birthday with Mum and Dad for a number of years. After a great day, during which I’d covered about 77 miles and some serious hills, I slept very well after being dropped back at the campsite. I was slightly worried about my rear wheel still, but had spare spokes, things couldn’t go that wrong could they?! This entry was posted in Bike around Britain 2013 and tagged adventure, bicycle, bicycle shop, bike, Bike around Britain, charity, countryside, cycle, cycle touring, cycling, Devon, expedition, fundraising, Hele, outdoors, photos, Porlock, Somerset on September 9, 2013 by SelfPropelled. 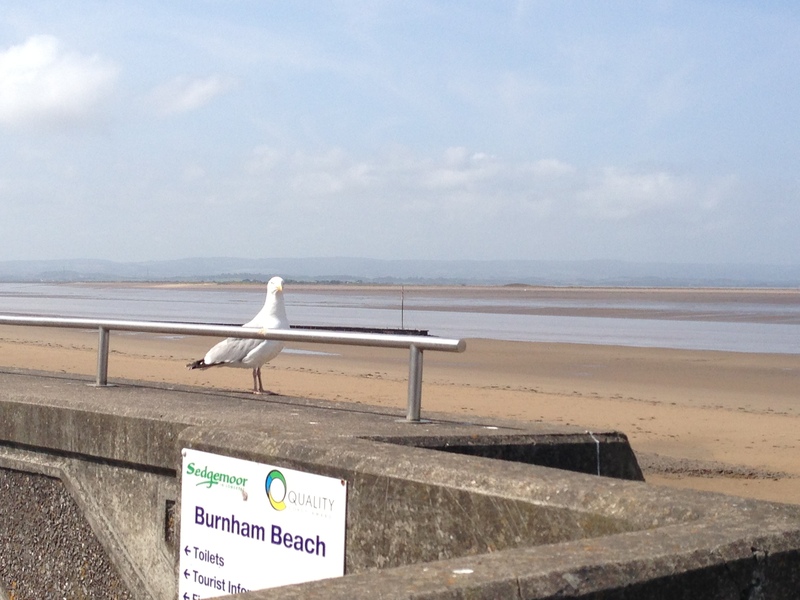 Very interesting blog, we frequent Brean, Burham and Berrow and have been to those places further south many years ago. Really interesting reading, makes one want to go again. I’ve. Got to say your Dad reminds me of a friend of mine going way back nick named Chico, keen on cycling and steam trains, any connection?